Student Morgan Murdock measures weight of leftover food as part of a food donation from Fountain Dining Hall to Raleigh Rescue Mission. During her first year at NC State, engineering student Morgan Murdock participated in an Alternative Service Break trip, where she served at a community center in a low-income neighborhood. “Something I noticed is that the kids were taking snacks but not eating the food. It just broke my heart that kids would have to save their food because they didn’t have dinner or snacks at home and didn’t know when their next meal would come,” she said. Nearly a year later, Murdock stumbled upon an opportunity that turned compassion to action. 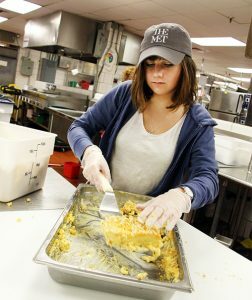 She learned about Food Recovery Network, a nationwide effort to redistribute perishable leftovers from campus restaurants to people in need, and inquired about starting a Food Recovery Network chapter at NC State. Less than six months later, Murdock and several other students partnered with NC State Dining for the first food recovery, redistributing leftover food from campus to a local nonprofit that addresses hunger and homelessness. NC State Dining’s leftovers are small in comparison to the up to 30,000 daily meals served at on-campus restaurants. To limit overproduction of food, campus chefs cook in small batches. Specialized software uses historic data to predict food consumption and how much food should be made that day. Dining also conducts food audits that explore opportunities to reduce waste. While these efforts limit overproduction, it’s nearly impossible for a restaurant to close for the day without any food overage. Sometimes food can be incorporated into the next day’s recipes or served again. But once food is cooked, food safety standards dictate when leftovers must be eaten or discarded. Nationwide, many restaurants throw away leftover food, contributing to annual estimates that 40 percent of the U.S. food supply is wasted. Several years ago, NC State Dining began redirecting food waste from the trashcan to the compost collection bin. Composting allows food waste to decompose into nutrient-rich soil amendment that’s perfect for growing gardens, grass and other landscaping. Food Recovery Network offered NC State Dining an even more sustainable solution for leftovers from campus’ three dining halls. Three times a week, student volunteers pack up dining hall leftovers and transfer the food to one of two downtown Raleigh nonprofits that serve the homeless. Student Aubrey Knier transfers leftover food from Fountain Dining Hall to reusable food containers that transport leftovers to one of two local nonprofits. A 1996 federal law called the Bill Emerson Good Samaritan Food Donation Act protects organizations from liability associated with food donations as long as appropriate food safety standards are followed. Food Recovery Network student volunteers receive food safety training and track information such as when food was prepared and any allergens. 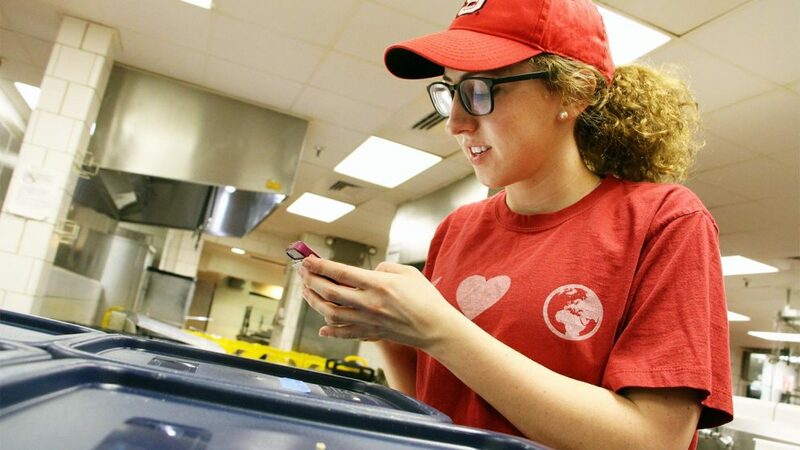 At the dining halls, volunteers transfer leftovers into reusable food containers, which were purchased with a small grant from the NC State Sustainability Fund. “The volunteering process is awesome because you get to see how much food you’re saving that would have otherwise been thrown away. That keeps me coming back to participate week after week,” said Austin Champine, a chemical engineering major. The students selected Raleigh Rescue Mission and the Men’s Shelter in Raleigh to receive food donations because of the organizations’ auxiliary programs that help with housing, education and vocational training. “Our non-profit relies on donations and could not function without them,” said Raleigh Rescue Mission chef Kirby Smith. In its first 18 months, the NC State Food Recovery Network chapter redistributed about 1,500 pounds of food, which is equivalent to about 1,250 meals. Published in Equity, Food, News, Newswire, Students, Uncategorized, Waste Reduction.